Ecologist Nalini Nadkarni was just looking for some extra hands to help her with her sustainability research. In a eureka moment, she realized that the incarcerated represented potential partners that are also extremely under-served. Not only did they have time on their hands, but many were hungry for intellectual stimulation and, as it turned out, energized by a desire to pursue their paths to reform through contribution to Nalini’s conservation biology work. Several years later, her Sustainability in Prisons project has become a wildly successful (and often emulated) example of how to combine innovative science with impactful engagement of under-served populations. 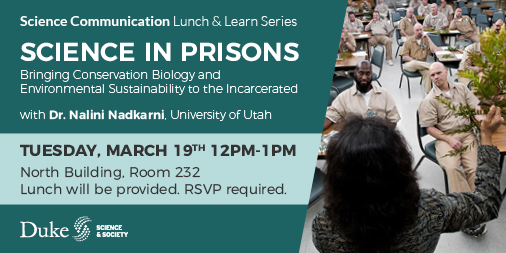 Come to SciComm Lunch-and-Learn to hear Nalini discuss her amazing, inspiring work communicating science in prisons and engaging the incarcerated in her conservation biology research. Nalini is an ecologist who pioneered the study of Costa Rican rain forest canopies by using mountain-climbing equipment to rise above the forest floor. She is currently an emeritus professor at The Evergreen State College and serves as a professor in the Biology department at University of Utah. She is very active in public science outreach, in addition to her work as an ecologist. Registration is now closed, but we will be live streaming the event on our YouTube channel.